21st January 2017.For most athletes, the winter is the time of year when they head indoors and change up their routine. When it gets cold outside, most people don't quite enjoy spending extra time in it just to exercise! For these individuals, the gym and its equipment offer a more enticing place to spend the winter. For those who love to swim, the same is true. Of course, if you have access to an indoor pool, you usually don't have to vary your routine too much. Why should you have to stop swimming outside just because it's a little chilly out, though? Believe it or not, winter swimming is an activity many people enjoy. At first, the idea of swimming in potentially frigid water may seem less than ideal. However, it can provide you with several benefits ? not to mention a much more interesting winter fitness experience! 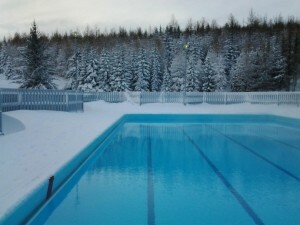 In this article, we'll put a microscope on what makes outdoor winter swimming worth considering. We'll also cover some of the potential risks; for some people, it can be a little too stressful on the body. We hope you find these tips helpful whenever the winter season begins to send your peers running indoors for the exercise machines. Why should anyone swim in cold water outside? You may not initially think that swimming in cold water would afford you all that many benefits over swims in water at your regular pool temperature. However, the reality is quite a stark difference from that. First and perhaps foremost, immersion in cold water has massive immune benefits as observed in several studies. The shock to the system that cold water brings to your body seems to boost the number of white blood cells in our bodies immensely. In other words, swimming in cold water regularly can actually help to boost your immune system. That's a serious benefit you won't get from regular swimming. However, from a fitness standpoint, it's a boon to your body as well. Cold water swims burn more calories just as a result of the water temperature. Why? Your heart must pump a lot harder due to the lower temperature. Combined with the exertion of actually swimming through the water and you have a recipe for a serious workout. If you want a way to work off all of those holiday calories, there's really no better way to do it than to take a plunge in your local swimming pool. You may also find that swimming in a natural body of water is more challenging than a pool. Swimming outside affords you an excellent opportunity to develop your form. By the time you return to the actual pool later on, it could be that your lap time shortens by several seconds. From the immune benefits to the positive effect it can have on your cardiovascular system over time, there are tonnes of benefits to taking a cold dip. How can you do so safely, though? Those who plunge into very cold water for the first time often experience several sensations that are new and can be frightening. For example, it's not uncommon for the water temperature to feel uncomfortable or even painful for the first few minutes of your immersion. The cold also causes your chest to feel constricted, which can lead to feelings of shortness of breath. How can you overcome these issues and begin to take advantage of what this activity has to offer you? The key is acclimatisation. You must ease your body into the water to learn how to mitigate its effects on your body and then use them to your benefit. How can you do that? Try several sessions of immersionover a short period. In other words, slowly ease yourself into the water until you are fully immersed for about five or ten minutes a day. Watch how your body reacts and try to overcome the feeling of discomfort. After a week or two of this activity, you should be ready to begin swimming in earnest. Wait a couple of minutes after immersion to begin your swim, and always have a clear start and end goal in mind. If you choose a lake as your swimming hole, never stray too far from shore. Keep an object you can swim to for stability if you find yourself having difficulty. Overall, common sense and an acclimated body will keep you safe and sound while you work out in the water. As a final note, never swim alone! This is a good rule of thumb to have whether you're outdoors or in the pool. In the winter and with the temperatures low, though, it's always a good idea to have a partner around ? just in case. Plus, sharing in the shivering as you exit into the winter air is an unforgettable bonding experience. While it is safe for most people to spend their winter swimming outside and learning to love the cold, there are some precautions to consider. While it can be a benefit for many, it's not perfect for everyone. For example, those who have breathing problems may find it is much harder to avoid going into oxygen debt while swimming in colder water. Even with acclimatising, you may still struggle to feel comfortable. Likewise, those with a history of heart problems should consider consulting their doctor before going for a cold swim. The cardiac muscles experience a substantially increased strain while swimming in cold temperatures, particularly since blood retreats from your skin and towards your organs. While heart attacks in the water are rare, it's still a potential threat. However, while you might think that senior citizens should shy away from this activity due to the cold involved, the opposite is actually true! In fact, many older folks find it to be a thrilling and invigorating activity. The addition of a wetsuit can help to guard against the most chilling effects of the cold while still allowing you to reap the benefits. Overall, the riskiness of cold water swimming mainly lies in doing it for too long or doing it alone ? both things you can easily avoid. How might one incorporate this type of exercise into their winter routine? In other words, how often should you be going out to swim? The answer is simple: as much as you like! While you probably won't want to go for a swim outside every day, three to four times a week ? like a regular schedule ? could provide you with a huge boost. Remember that you'll be challenging yourself to improve, so seeing some gains is likely. Start your acclimatisation process early, before the air gets too chilly; that will leave you with more time to spend developing in the water. To add a little more fun, you can look for a local winter swimming club. Many people wholly embrace this activity and love participating every year. Why not join the action with them? You can learn from those who are more experienced in dealing with the cold while also meeting some new friends. In the end, you'll all take the plunge together. There's safety in numbers, and definite advantages to draw on from the encouragement as well. Will you test the waters this winter?